Once again, I was struck with a "Unity" moment. They are the unexpected times when someone shares with you a personal story, or offers help. I am often struck by the generosity of those who have very little. I was visiting Broadway United Methodist Parish today. Thought I would catch up with some old friends, have some great coffee, and take a look at the Unity Garden there. One of my friends, Johnny, actively cares for the Ravina Park Unity Garden. 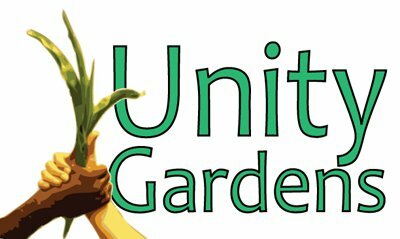 We always enjoy talking about the gardens, sharing any Unity Garden news, and just catching up in general. He was telling me about what was harvestable, how long he watered, and then he really surprised me. He asked if we accept donations for Unity Gardens! Of course, I explained and a little goes a long way toward purchasing garden supplies! We both went away feeling good about our work in the community; our shared commitment to make our community a little better, one vegetable at a time!